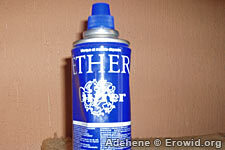 Ether is a volatile liquid that's vapors act as an anaesthetic when inhaled. It has been used both medically and recreationally since the late 1800s. Ether is Extremely Flammable. Also note that diethyl-ether and "petroleum ether" are different substances. "Petroleum ether" is not an ether. Can you extract ether from starter fluid?